The #1 Place For Dropped Axles! The #1 place for custom dropped axle alteration. Welcome to Nostalgia Sid's LLC website the #1 place for custom dropped axle alteration. I am here to help you on your old car or pickup truck front axle needs. For the original car guy, we offer axle straightening and king pin resizing to stock axle specs. For the traditional hotrod or ratrod guy, we offer a Jig dropped axle and axle drilling. All of our dropped axles are straighted, set to factory spec. to within .5 degrees, king pin bores resize to original bore size, sandblasted and magnafluxed to check for cracks. We drop the axle the vintage way like they did years ago. We use factory forged steel axles for 1928-64 Ford, Chevrolet, Dodge and other brands. We will do custom axle drops and can narrow axle during the drop. We offer complete axle setups, king pins / installation, steering arm modifications, and tie rod drop blocks. On this website, you will find tech. 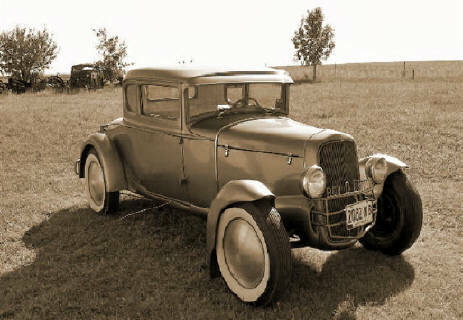 articles, traditional hotrod parts, and a photo album of customers cars and trucks. If you have a suggestion please contact me. I was born and raised around traditional hotrods. Not only are hotrods my living but they are my life.